It is fitting that Bastille's Other People's Heartache Pt.4 mixtape begins with a stark cover of Cat Stevens' Wild World and closes with a similar re-work of their own 'wild world' quoting song. Warmth. The new collection of covers and collaborations serves as a bridge from the sentiments found on the band's second album of the same name to their third album due early next year. "We wanted to nod to our last album and acknowledge that at the time, you couldn't help but feel anxious about the terrifying changes in the world and that since then, they've all come to pass and everybody"s living through the consequences" explains front man Dan Smith. "Obviously these feel like perpetually stranger times, so it feels like different forms of escapism and distraction are more vital than ever." If the Other People's Heartache series began as soundtracks to a series of imagined films, then this time, it's the playlist to an apocalyptic party that plays out like a hazy meander through pop culture via the minds of Bastille. The series of mixtapes were started in 2012 as a way for the band to collaborate with other artists and experiment with different styles, genres and production techniques, using films and other people's heartbreak songs as a canvas. Over time they've become almost as big a part of the band as their recorded albums. Festival backstage run-ins, tour-circuit hangouts and various recording sessions around the world led to many inventive, original collaborations with artists like Haim, Kate Tempest, Lizzo, Ella Eyre, Angel Haze, Rag'n'Bone Man, MNEK and Skunk Anansie. "There's something liberating about taking songs that we remember affectionately and presenting them in a totally different light" Dan says. "Like an homage or remake or even something a bit tongue-in-cheek, I think there's something brilliant in music that connects with people being able to echo on through time via other people's interpretations." 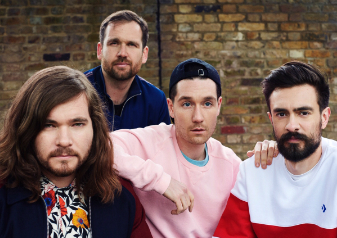 Bastille play The Brighton Centre on Friday 1st February 2019. CLICK HERE for tickets.